Although the benefits that wetlands provide make them some of our most valuable landforms, the United States and Michigan have lost alarming amounts of wetlands. The United States was at one time blessed with an abundance of 225 million acres of wetlands. 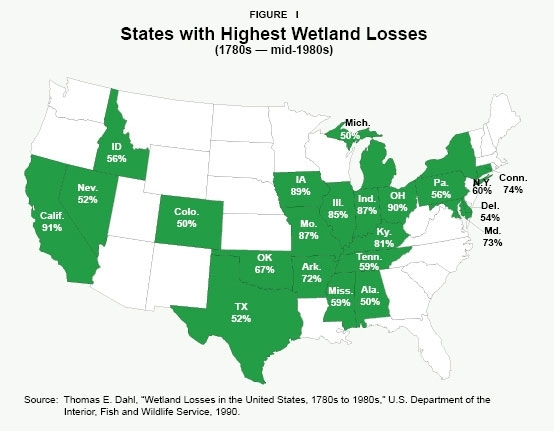 Since European settlement, the lower 48 United States have lost over 53% of their original wetlands. The lower 48 states contained an estimated 105.5 million acres of wetlands in 1997. Great Lakes states and the province of Ontario have fared worse – it’s estimated that only 30% of the original wetlands remain in the Great Lakes Basin. In the most recent survey conducted by the U.S. 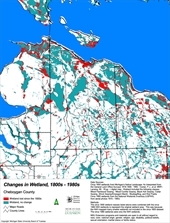 Fish and Wildlife Service, Michigan has lost 50% of its original wetlands. 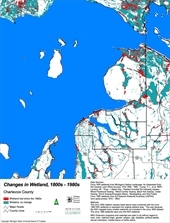 The percentage of Michigan’s coastal wetlands that have been lost is even greater--70%. 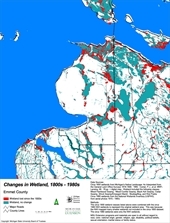 In total over 5,600,000 acres of wetlands have been damaged or destroyed in Michigan. Without the dramatic flair of Hollywood, wetlands are still seen as breeding grounds for mosquitoes; some take the claim even further with wetlands serving as the breeding grounds for mosquitoes that are carrying the West Nile virus. Even our language has been shaped by this cultural history and societal perception of wetlands; “bogged down,” “mired,” “swamped,” all have negative connotations. For hundreds of years, wetlands have been seen as wastelands, only useful if converted. Due to this belief and negative perception, wetlands across the country have disappeared.